In scientific circles, NaHCO3, or sodium bicarbonate, is a substance with the more common designation of baking soda. Known as a leavening agent in baking, you’ll find it in the cupboards of most households; in the kitchen, it allows batter and dough to form air bubbles and rise. But a recent study1 shows that baking study does much more than that. The Journal of Immunology reports that in a clinical setting, baking soda also “stimulates splenic anti-inflammatory pathways” or, in layman’s terms, fights inflammation in the spleen. Medical News Today5 offers a short clarification to explain the foundation of the study: that baking soda provides a signal to mesothelial cells, which line your internal organs and other body cavities to prevent them from sticking or rubbing together. Meanwhile, they assure these cells that your body is doing fine; it’s not under attack, so developing an aggressive immune system and/or a harmful autoimmune response are unnecessary responses. “In the spleen, as well as the blood and kidneys, they found after drinking water with baking soda for two weeks, the population of immune cells called macrophages, shifted from primarily those that promote inflammation, called M1, to those that reduce it, called M2. One of the jobs kidneys perform involves balancing such vital compounds as sodium, acid and potassium, O’Connor maintains. One problem that crops up with kidney disease, besides diminished function, is excess acid in the blood, which often results in additional conditions such as heart disease. O’Connor describes the mechanism as a system that’s basically set up for failure, but that baking soda emerges as a “cheap, over-the-counter antacid” that fights inflammation at the same time. The study involved healthy medical students at MCG’s Georgia Prevention Institute, who drank a bottle of water with baking soda added. Citing the involvement of acetylcholine, O’Connor explains that the “cholinergic” signaling, again, is not from the vagal nerve in the spleen, but from the mesothelial cells forming the connections to it. Besides causing acidic ingredients like buttermilk and cocoa used in baked goods to expand the batter, baking soda has numerous other applications for health, cleaning and personal hygiene. Earlier, mesothelial cells were described as functioning as buffers, as they create a slippery layer to protect cell walls from damage if they should rub together, a frequent cause of inflammation. But of course, there’s nothing to prevent you from using baking soda, as it’s a natural substance used by people for centuries for a number of health conditions, and more. “Prior to the 18th century, people had to spend between 12 and 24 hours making yeast – not an easy process without refrigerators and other equipment that we’re lucky to have today. It wasn’t uncommon for yeast not to turn out the way it was supposed to because the temperature was either too cold or too hot. Something a generation of individuals from the 19th century had passed down was a concoction known as “vinegar punch,” made from apple cider vinegar mixed with a teaspoon of baking soda, which required a quick stir and a quick gulp. It was often used for gastrointestinal discomfort and usually elicited relief from pain, upset stomach, heartburn, acid reflux and even diarrhea. But there’s more to the acidic environment that baking soda creates for improved health than an old wives’ tale. One study notes that because it helps raise your pH, it can ease urinary tract infections, or UTIs.15 In addition, because your circulatory system helps supply blood to your vital organs, baking soda can help detoxify your blood and help improve your blood flow. Another study17 notes that baking soda has been useful for runners and other athletes for decades, as the soda increases the buffer-like action of lactic acid. People who engage in intense exercise don’t experience the accumulation of lactate and subsequent muscle pain, which naturally results in better and more comfortable workouts. It’s known that baking soda can stand up to Streptococcus mutans bacteria that can cause tooth decay.18 You can use it on your toothbrush to whiten your teeth, as well, which is less expensive than purchasing a toothpaste with baking soda in it. Leaving it on for five minutes further whitens teeth, but should be followed by a vigorous rinse to avoid a gritty feeling; this method should be used no more frequently than once per week. According to research at the University of California, if you notice you’re experiencing an irregular heartbeat, or if you’re taking thyroid medication, starting on a regimen that includes baking soda is not advised.19 If you notice itching, hives, swelling or tingling in your mouth or throat, stomach pain, headache or shortness of breath after using a baking soda solution orally, discontinue use. An Antiseptic salve that aids in speedy healing and helps to prevent scarring. Use on minor cuts and other skin problems. 2 stainless steel 1/2 quart pans or 1 cup size. Place oil in pan and set on very low heat. When it’s near hot-add Goldenseal. Stir well then add Cloves. Continue stirring…. As summer gives way to fall, I invite you to consider eating some of the superfoods that are at their peak this time of year. Certain fruits and vegetables are more readily available locally during fall, including apples, pumpkins and squash. When preparing your seasonal menu, be sure to add some of these 12 fall superfoods to your grocery list. To find the freshest seasonal produce, visit your local Community Supported Agriculture (CSA), farmers market or food co-op. Apples – Apples ranked second behind bananas in 2017 as the fruit most frequently eaten by Americans,1 perhaps due to the adage “an apple a day keeps the doctor away.” While you’ll want to keep a close eye on your total daily fructose intake, and most certainly avoid an all-fruit diet, eating whole fruit like apples can be beneficial to your health. Research suggests apples are a great source of antioxidant and anticancer phytochemicals, most of which reside in the skin.2,3 Apples are also prized for their ability to promote healthy digestion, with one medium apple boasting about 4.4 grams (g) of fiber. To ensure you receive the best of the flavanoids and polyphenols apples have to offer, you’ll want to eat the whole fruit, including the skin. Because apples are one of the most pesticide-contaminated foods, you’ll want to buy organic. However, the apple peel is far more concentrated than the flesh. If you live near an organic apple orchard, you may enjoy picking your own. Want a healthy spin on an old favorite way to use apples? Try my “Health-Boosting Apple Crumble Recipe.” Remember, apples contain fructose so eat them in moderation. Beets and beet greens – Beetroot contains high amounts of fiber and infection-fighting vitamin C, as well as nutrients that help you detoxify, fight inflammation and lower your blood pressure.4 As a source of healthy nitrates, the consumption of beets boosts your nitric oxide levels. Beetroot may also help combat cancer, particularly cancers of the breast and prostate.5 I include about 1 to 2 ounces of raw beets in my daily smoothie and also take a powdered fermented beetroot supplement. Due to beets’ high sugar content, raw beet juice may not be a healthy choice for you, especially if you have diabetes or are insulin resistant. If you routinely discard beet greens, you should know they are an excellent source of vitamins A and K, as well as calcium and potassium.6 Beet greens are quite tasty steamed or you can sauté them with a little raw grass fed butter and salt. Check out the video above for six more reasons you should eat beets. They’re also a good source of vitamin B6, choline, fiber, manganese and potassium. A 2009 study published in Food Chemistry highlighted the chemopreventive properties of cruciferous vegetables such as Brussels sprouts, kale and broccoli. Cauliflower – Cauliflower contains an impressive array of nutrients, including vitamin B6, fiber, magnesium, manganese, phosphorus and potassium. It also is packed with natural antioxidants, such as beta-carotene, kaempferol, quercetin, rutin, vitamin C and others, which defend against free radical damage. Cauliflower contains the cancer-fighting compounds sulforaphane and isothiocyanates, the former of which has been shown to kill cancer stem cells responsible for its spread.9,10,11 The sulforaphane found in cauliflower may also help improve your blood pressure and kidney function.12 View the video above to discover more of the health benefits associated with cauliflower. Two ways you can enjoy cauliflower as a comfort food include steaming and mashing it to make “caulitators,” a healthier substitute for traditional mashed potatoes, and using it to create a mouth-watering cauliflower pizza casserole or cauliflower pizza crust. Raw grated daikon (known as daikon oroshi) has a taste less pungent than, but similar to, horseradish. This ubiquitous Japanese condiment is served with many meat and fish dishes, and is also added to sauces for soba noodles and tempura. Particularly during the winter months, dried daikon and pickled daikon are important staples of the Japanese diet. Kale – Kale is a powerhouse vegetable loaded with antioxidants, calcium, fiber and vitamins A, C and K. The carotenoids lutein and zeaxanthin found in kale help protect your eyes against macular degeneration. A 1-cup serving of this healthy green contains significant amounts of vitamin C and about half as much calcium as a cup of milk.16,17 It also provides plant-based omega-3 fatty acids and 18 amino acids. Kale’s anti-inflammatory properties are said to help prevent arthritis, autoimmune diseases and heart disease. Studies suggest kale can help reduce your risk of heart disease because it optimizes your cholesterol, including raising your high density lipoprotein (HDL).18 The presence of cancer-fighting sulforaphane and indole-3-carbinol are other reasons to eat kale. Kumquats – This tiny yellow-orange fruit, which resembles a small oval orange, boasts a sweet-yet-tangy flavor and a hint of bitterness. What sets kumquats apart from other citrus fruits is the fact its skin and zest are sweet and can be eaten. Kumquats are a low-calorie fruit, with 100 g of fresh kumquats containing just 71 calories.19 This fruit is rich in antioxidant vitamins A, C and E and contains flavonoid antioxidants such as lutein and zeaxanthin. While kumquats are delicious when eaten whole, they do contain fructose so I suggest you eat them only occasionally. Kumquats can also be incorporated into fruit salads or used as a glaze for duck and other fatty meats. They are a fine addition to poultry stuffing and can also be used as a dessert topping. Pomegranates – While popularized in the U.S. in juice form, I recommend you consume pomegranates as a whole fruit. Even though it takes concentrated effort to extract the 600 or so juice-filled seed sacs (called arils) found in the average pomegranate, you’ll be rewarded with not only a wonderful tart flavor, but also a number of health benefits. But, just like apples, the bulk of the polyphenols and phtyochemical benefits are stacked away in the peel that is relatively bitter. But it can be dried and powdered and put into capsules and taken as a supplement. A 100 g serving (about one-half cup) of pomegranates contains roughly 7 g of fructose.22 When adding pomegranates to your diet, keep in mind that I recommend limiting your daily fructose intake to 25 milligrams (mg) or less if you are healthy and less than 15 mg if you are dealing with a chronic illness. Pumpkins – Pumpkins are among the most quintessential fall produce. While they are artfully carved in celebration of Halloween, pumpkins also feature prominently on Thanksgiving tables as decorations and, of course, in the form of pumpkin pie. View the video above for a summary of the health benefits associated with pumpkins. Beyond decorations and pie, pumpkin is useful for its seeds. Pumpkin seeds are a convenient source of magnesium, plant-based omega-3 fats and zinc. To obtain the healthy omega-3 fats, you must eat pumpkin seeds raw. If you prefer to eat the seeds roasted, do so yourself as a means of controlling the roasting temperature and time. For best results, sprinkle raw pumpkin seeds with pink Himalayan salt and roast them at no more than 170 degrees F (75 degrees Celsius) for 15 to 20 minutes. Store roasted pumpkin seeds in an airtight container. Squash – With names like acorn, banana, butternut, delicata, kabocha and spaghetti, along with various crook-necked varieties, squash abounds in fall. The creamy, luscious texture of butternut squash, for example, along with its distinctive aroma and flavor provide just a hint of sweetness that enlivens fall soups and stews. A popular way to prepare butternut squash, which is high in vitamins A and C, as well as folate and potassium,23 is to simply bake or steam it in chunks or halves. Although it needs no enhancement, you may enjoy squash with a pat of grass fed butter and a dash of salt. Alternately, to accent its natural sweetness, you can top it with honey and cinnamon to give it a dessert-like presentation. Given the starchy nature of most squash varieties, you’ll want to eat this fall crop in moderation, however. If you eat the skin, which is nutrient rich, you should opt for organic varieties. Squash stores well and some varieties will last for several months when maintained in a cool, dark place. Swiss chard – While not as popular as kale, Swiss chard packs many of the same nutritional benefits, such as high amounts of vitamins A (as beta-carotene), C and K.24 The vibrant array of colors associated with Swiss chard signal the presence of phytonutrients that are prized for their anti-inflammatory and antioxidant properties. Enjoy Swiss chard in salads, smoothies or vegetable juice, or lightly steamed or sautéed as you would other leafy greens like spinach. Like all vegetables, it’s healthier when eaten organically. Turnips and turnip greens – Turnip taproots and their greens, which are somewhat bitter, are both edible and nutritious. Turnip taproots are a hearty addition to soups and stews, have a mild flavor and bring forth a potato-like texture when cooked. You can steam turnip greens to reduce their bitterness or toss them with a citrus vinaigrette dressing to balance out the sharp taste. Cook turnips in a manner that allows them to retain some of their characteristic crunch. When eaten raw or prepared in healthy ways, these fall superfoods enable you to receive beneficial nutrients while still enjoying some of the season’s traditional comfort foods. Bon appetite! If you see a term you don’t understand, be sure to check our Alternative Health Glossary of Medical Terms! Scent: Lemony, almost buttery, camphoraceous, warm. 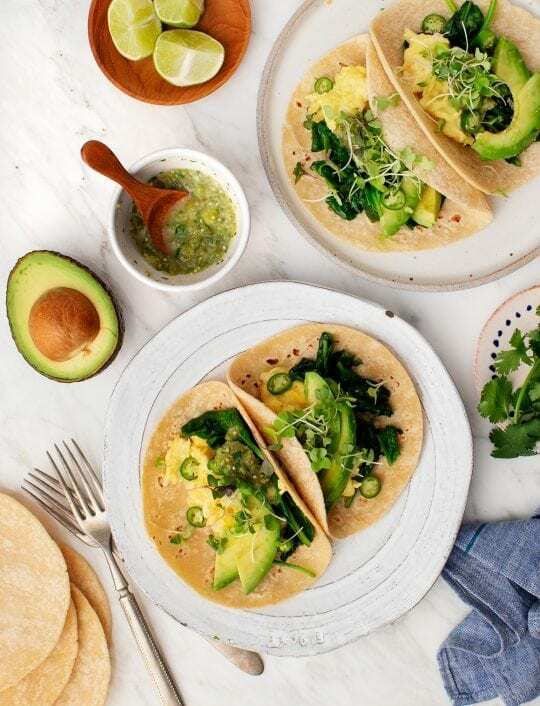 The post Simple Spicy Green Breakfast Tacos appeared first on Love and Lemons. You may have heard that the first place to start when healing from a chronic disease is to treat the digestive tract, or gut. There are a number of reasons why this is a good place to start in many situations, and one of them is the leaky gut. Leaky gut occurs when the junctions between cells in the small intestine break down, and allow larger food particles, toxic molecules, and bacteria into the bloodstream. This increases the immune and inflammatory response, which can impact a tremendous number of illnesses, such as autoimmune disease, skin issues, mood disorders, allergies, and digestive symptoms. A leaky gut also makes absorption of vitamins and nutrients more difficult. A reason why leaky gut might be so common is the amount of sugar and refined grains that we tend to eat. These things are very inflammatory to the digestive tract, and over time work to break down these cellular junctions. The good news is that leaky gut is fairly simple to repair. The first step, and the most important, is eliminating sugar and refined grains from the diet. In order to give the gut time to heal, these non-nutritious and inflammatory foods need to be removed. The second step is to figure out if there are any food allergies or sensitivities that you have, or have developed, because of the leaky gut (the immune system can become triggered by food particles that have gotten past the intestinal barrier, causing immune reactions to certain foods – these are often able to reverse after the gut is healed). Removing foods that are causing an immune reaction is also very important. There are a couple of supplements that can be beneficial to help heal leaky gut. Your naturopath may recommend one, or more of them. Probiotics help reintroduce more “good” bacteria into the intestine. These bacteria are incredibly important to maintaining nerve and digestive function, balancing mood (energy), as well as working hand in hand with the immune system. Over years and years of chronic inflammation in the digestive tract, the numbers of good bacteria diminish and are replaced by more gas forming strains, as well as fungus, like candida. A probiotic is often recommended in order to re-balance the gut flora. Leaky gut limits the amount of food that is actually getting broken down and absorbed. A digestive enzyme may be used in order to help break this food down. They are often taken with food to help with the digestion of food with each meal. This will help prevent some of the undigested food from getting into the bloodstream. Glutamine is perhaps the most important supplement for helping the gut. This amino acid serves as a primary food source for the cells of the intestines, and will help them repair the junctions between them quicker. Licorice helps keep the mucous lining of the gut intact. This protects the intestines from their own acids and helps keep things from inflaming the gut wall. Licorice also helps lower the effects of stress hormone (cortisol). Deglycyrrhizinated licorice is often preferred because the glycyrrhizin, a constituent in licorice, has been shown to raise blood pressure and cause edema – this makes it safer in pregnancy as well. Collagen can be taken in broth form or in a powder. It is crucial to the repair of soft tissue, like the intestines. It also can help improve digestion. Bone broths are often used as anti-inflammatory foods during a gut healing protocol because of their richness in collagen as well as other vitamins and minerals. The post Fixing “Leaky Gut” is a Good Place to Start appeared first on NaturalPath. A first ever study to look at the effects of radiofrequency electromagnetic field (RF-EMF) on the brains of adolescents has found that this type of radiation may affect memory in the brains of teenagers.1 RF-EMF exposure has increased tremendously over the last 25 years with an increasing usage of devices that rely on these frequencies to operate. The most common source of exposure to the brain is the use of the mobile phone close to the head. This is the type of exposure this study researched. The study was conducted in Switzerland at the Swiss Tropical and Public Health Institute (Swiss TPH), and specifically assessed the association between RF-EMF exposure from wireless devices and memory performance in teens. The study is part of a follow up on a 2015 study on the same topic – these are the world’s first epidemiological studies on this topic. About 700 participants were recruited from both rural and urban junior high schools in Switzerland. Ages ranged from 12 to 17 years, and participants were followed for one year. The study found that cumulative brain exposure to RF-EMF from cell phone use was negatively correlated to memory performance. This confirmed the prior results published in 2015. Specifically, figural memory was seen to be affected most. Figural memory is primarily located on the right side of the brain, and individuals using phones on the right side of the head were noted to be more affected by the RF-EMF. The authors of the study commented that this correlation may support the hypothesis that it is the RF-EMF being absorbed by the brain that is responsible for the noted associations. The study does also comment that other forms of wireless communication, such as sending text messages, and using the internet were not found to have an association with memory performance. The authors also mention that drawing conclusions at this time is not possible due to the changes that are seen in the brain, behavior, cognition, and also mobile phone use during puberty. Further research is certainly needed. The RF-EMF exposure question is a relatively new field of research, yet it may not be a bad idea to advocate headphone use over direct contact with the ear during wireless device use. Razi Berry is the founder and publisher of the journal Naturopathic Doctor News & Review that has been in print since 2005 and the premier consumer-faced website of naturopathic medicine, NaturalPath. She is the host of The Natural Cancer Prevention Summit and The Heart Revolution-Heal, Empower and Follow Your Heart, and the popular 10 week Sugar Free Summer program. From a near death experience as a young girl that healed her failing heart, to later overcoming infertility and Chronic Fatigue Syndrome and Fibromyalgia though naturopathic medicine, Razi has lived the mind/body healing paradigm. Her projects uniquely capture the tradition and philosophy of naturopathy: The healing power of nature, the vital life force in every living thing and the undeniable role that science and mind/body medicine have in creating health and overcoming dis-ease. Follow Razi on Facebook at Razi Berry and join us at Love is Medicine to explore the convergence of love and health. The post Phone Radiation May Impact Memory in Adolescents appeared first on NaturalPath. Is Your Immune System Causing Your Chronic Fatigue?